Bell Labs Hal Alles Synthesiser, Hall Alles, USA, 1976. The 'Syn-ket' (or 'Synthesiser-Ketoff'). Paolo Ketoff & John Eaton, Italy. 1963. 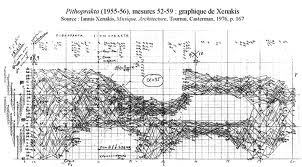 Published in‘UPIC system’ (Unité Polyagogique Informatique du CEMAMu) Patrick Saint-Jean & Iannis Xenakis, France, 1977.